Companies offering products and services know the value of promotional programs, advertising campaigns to get the attention of the prospective buyers. Moreover, when it comes to promoting the businesses then, the big businesses definitely have an edge over the small ones as they have the resources to dedicate to content marketing. However, the game is not all lost for the small businesses as they can also reap on the benefits of the content marketing by making proper promotional strategies. The first step to this is to understand the dynamics of the modern lead generation activities and then identifying on the activities that can potentially increase the sales. After this, the next step is to decide on the tactics that you would like to capitalize and finally making plans to implement those tactics. 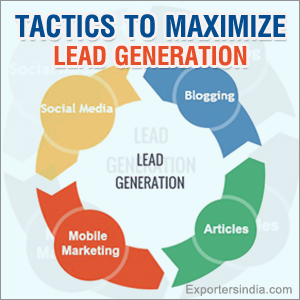 So, now let us get familiar with some of the popular modern lead generation tactics. Modern day internet technology has truly changed the ways of generating leads for maximizing sales. The increasing popularity of the social networking sites has encouraged the businesses to utilize their potential to cultivate sales. Social Media Sites- Social networking sites like Facebook, LinkedIn, and Twitter offer the businesses a common platform to interact with the potential customers and stay in touch with the existing ones. They can put on attention grabbing status update, offer informational material, advertise for new promotional events, activities and create new B2B contacts. Blogging - Blogging is a great way to educate your customers about the products and services that you are offering. By engaging in an interaction with the readers through comments, reviews, buying preferences, likes and even dislikes, you can generate leads to improve your businesses. Taking a check on the comments and engaging into an interaction is also helpful. Mobile marketing - Smart Phones have really become popular where most of the people have an access to it. This has necessitated for the companies to have mobile websites that are compatible to mobile phones. With the help of mobile websites, the companies will get closer to their prospective customers. Articles and Newsletters- The articles can vary in length depending upon the topic and the requirement of the place where they will be published. They can be put on the online websites to provide the information to the customers. However, other places where they can be published are print and online magazines, and newsletters. Therefore, now you can choose the tactics from the ones listed above and capitalize it for generating leads for your businesses.